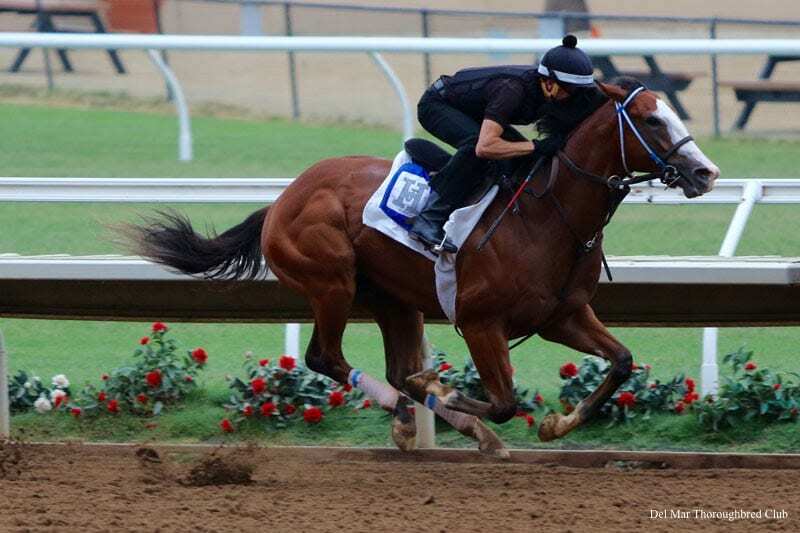 OXO Equine's Instagrand, who appeared every cent worth his $1.2 million purchase price in breaking his maiden by ten lengths in fast time in late June, figures to be a prohibitive favorite Saturday when he heads a field of five 2-year-olds in the Grade 2 $200,000 Best Pal Stakes at Del Mar. Instagrand, with Drayden Van Dyke in the saddle, will be opposed in the six-furlong sprint by Owning, Mario Gutierrez; Mason Dixon, Flavien Prat, and Sparky Ville, Gary Stevens, all of whom won their first races this summer, plus the maiden Synthesis, to be piloted by Kent Desormeaux. Instagrand, a son of Into Mischief trained by Hall of Famer Jerry Hollendorfer, performed as advertised in his career debut at Los Alamitos. Going off at 2-5, the colt won brilliantly, racing five furlongs in a swift :56 flat. The bay colt was bought out of Fasig-Tipton's Florida sale of two-year-olds in training last March. Of his foes, Owning could be most dangerous to the favorite. The Flashback colt, trained by Simon Callaghan, won his only start easily, by two and one-half lengths in solid time for Reddam Racing. Mason Dixon won his career debut at Del Mar July 21, while Sparky Ville scored in his second outing at Santa Anita June 9. Synthesis has been to the gate three times, finishing third twice and fourth most recently behind Rowayton. The Best Pal is the major steppingstone to the G1 $300,000 Del Mar Futurity on closing day, Labor Day Monday, Sept. 3. This entry was posted in NL List, Racing and tagged california horse racing, Del Mar, instagrand, jerry hollendorfer, larry best, oxo equine by Del Mar Thoroughbred Club. Bookmark the permalink.